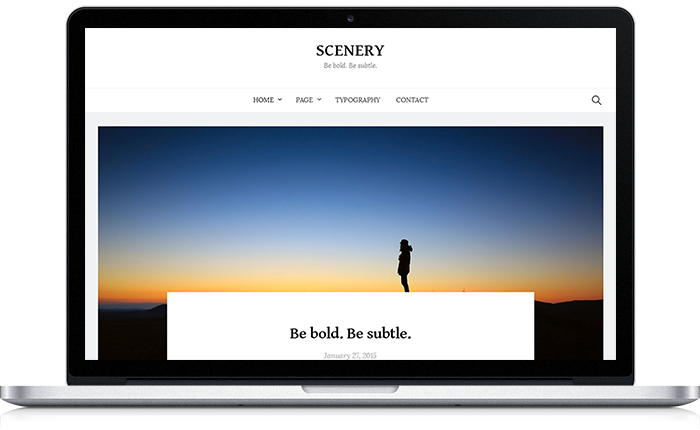 Scenery is a minimal one-column WordPress theme that beautifully blends boldness and subtlety. Scenery uses large featured images and ample margins to create an impressive layout. At the same time it has been made with thorough attention to details like typography. The end result is Scenery’s unique beauty. Scenery will show its beauty the instant you activate the theme. You don’t have to fight with the Customizer or pages to get the theme working. Moreover it’s been firmly designed so its visual appearance won’t collapse. Scenery offers excellent customization. In addition to 5 widgets and 4 menus, you can also set custom backgrounds. Furthermore you can also modify various theme options including fonts, colors, layout, title, and logo through the Customizer. Scenery was built with mobile-first responsive design in mind, so it offers a pleasant reading experience on both smartphones and tablets. Scenery allows you to modify various theme options including fonts, colors, layout, title, and logo through the Customizer. Scenery comes with 4 footer widgets. Furthermore, it also features a widget area that follows posts. 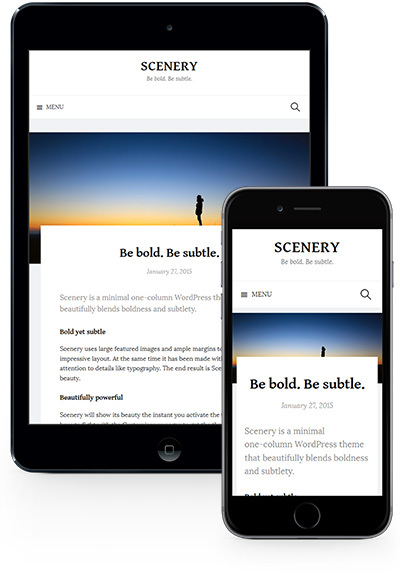 Scenery supports 4 menus: Navigation Bar, Header, Footer, and Footer Social Links. You can choose which menus to use or not use. Scenery supports custom backgrounds, so you can freely change your site background. Scenery supports the multifunctional plugin Jetpack which adds features like widgets and infinite scrolling, as well as the contact form plugin Contact Form 7. Scenery supports multiple languages. Currently supported languages are Japanese and English, and typography has been appropriately adjusted with CSS for Japanese. Scenery is made with people who want to customize its code in mind and adheres to WordPress standards while maintaining clear, readable code. We offer the following services for our paid themes. Themehaus only charges for the WordPress theme at purchase time. Support and updates are included and there are no additional charges. Themehaus uses a GPL license for our WordPress themes. You may use them for an unlimited number of personal/business sites. Themehaus’ WordPress themes include support for common issues. Support for the customization and plugins is not included.